I wanted to get something for my co-workers but since the economy is tuff this year I made them something. 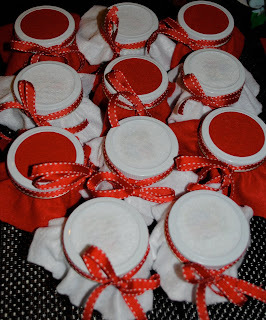 I took mason jars, filled them with holiday candy and topped them with material with candy cane inspired ribbon. Nothing fancy but it is the thought that counts, right?!? I think thats a cute idea! How cute I would love to get one of those! Those are adorable. I LOVE homemade gifts!